Saute onion in about 1 tbsp olive oil over medium heat until translucent; add mushrooms and saute until mushrooms are just slightly firm and onion slightly caramelized, about 10 minutes. Set aside. Remove pizza crust from package and press into a 14 by 10 inch rectangle on a lightly greased baking sheet or baking stone (you may have to wait for the dough to warm up a bit so it's more malleable). Spread 3 to 4 tbsp tomato sauce on top of dough depending on how saucy you want the stromboli. Sprinkle with desired amount of dried oregano and basil. Sprinkle the fontina cheese on top of the dough, then add the mushroom-onion mixture. Top with mozzarella. Fold in short sides of dough by 1 inch, then fold in long sides over each other, overlapping in the center. Pinch to seal. Carefully flip dough over so the seal is on the bottom (if you're nervous about this step, skip it: The stromboli just looks prettier with the seal on the bottom, but it's not necessary). Around these parts, football season is in full swing. In Iowa City, those who bleed black and gold – basically everyone – gather together nearly every weekend through the fall to cheer on their beloved Hawkeyes. Though I’m not a huge college football fan, I do love a good tailgate. And around here, tailgating is a serious business. Forget bags of chips and store-bought veggie trays – people go for the win when it comes to their culinary creations. 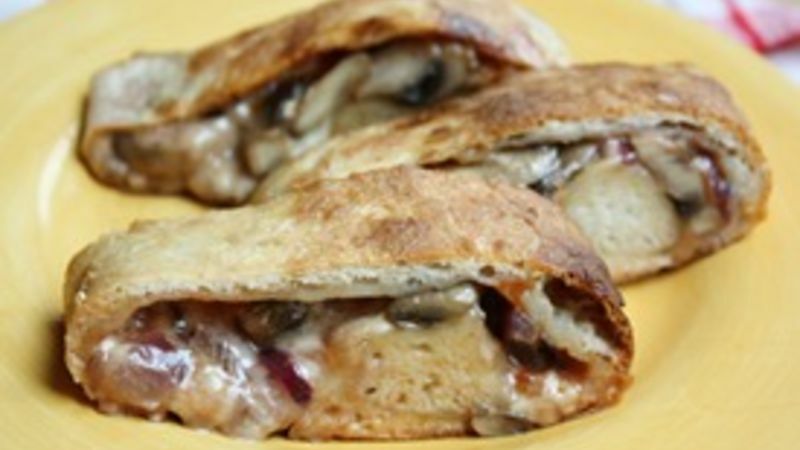 One of my favorite things to bring tailgating is this delicious Mushroom Fontina Stromboli. Even during early tailgating sessions it’s a hit, and I can make it just before I have to run out the door. Let’s just say that on cooler Saturdays, this warm stuffed-crust creation gets a lot of attention. What makes this Stromboli a winner is the tangy flavor of the creamy fontina cheese, which is illuminated even further when mixed with meaty mushrooms and caramelized onions. If you want to add meat, sausage or shredded chicken is a delicious addition. Bell peppers are a great non-meat addition. And if you’re not a fan of fontina cheese, just swap it out for another tangy cheese, like white cheddar. Even if you don’t live in a college town or tailgate, this is a great recipe for a quick and simple dinner on a cool fall evening, or as an appetizer for Italian night. No matter what you make it for, you’re guaranteed to have some serious fans!